February arrives next week and South Bank and Roma Street Parklands are celebrating with a range of fabulous free events, which one will you be attending? What better way to spend Valentine's Day then a night under the stars with someone you love, at Roma Street Parkland. Bring a picnic rug, chair or even bean bag if you like and relax under the warm summer night sky as you catch the free screening of the ever-popular romantic comedy, Crazy, Stupid, Love (M) on the Celebration Lawn. BYO gourmet picnic or grab something from the onsite food vendors - who will keep you fed until late. The food trucks will open from 5:30pm, and the movie will be kicking off at 7pm. Celebrate Asian pop-culture with a huge line-up of talented performers and entertainment including anime, cosplay, fashion, k-pop, and synchronised swimming. This free, all-ages event will come alive as South Bank Parklands’ Piazza becomes a pop party full of electrifying, non-stop entertainment from 5pm to 8pm. A free screening of the highly anticipated anime Fireworks (Should We See It from the Side or the Bottom?) will commence at 8.15pm. This film is in Japanese with English subtitles (90 minutes). Kisaragi-Sai Festival returns to Roma Street Parkland on Saturday 24th of February, for its 4th year. Experience the flavours of Japan with a range of pop-up food stalls, plus much more all in the one summer night-time festival. The event showcases the many facets of Japanese culture and society with a range of Japanese music and dance with performances across two stages on Celebration Lawn from 5pm-8:30pm. There will also be martial arts, Bonsai, Ikebana (the Japanese art of flower arrangement), market stalls, artist demonstrations, exhibitions and children's activities. At 8.30pm, catch the free screening of Ancien and the Magic Tablet in the Amphitheatre – a Japanese-language film with English subtitles (110 minutes). Visit brisbanemetropolitanbands.com for further details. 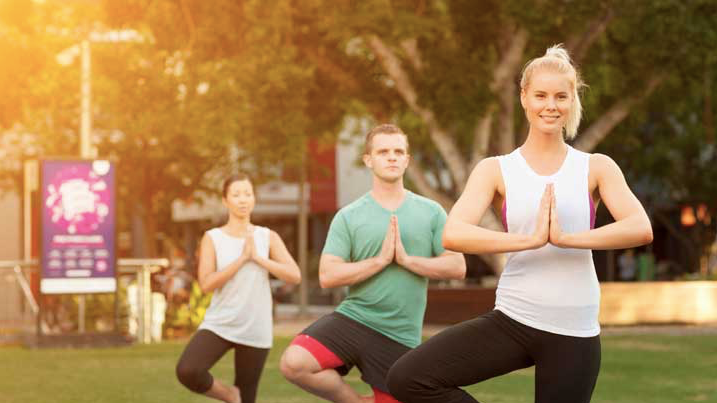 Get out and enjoy the evening air with the Medibank Feel Good Program of free fitness classes at South Bank Parklands. All classes run for 45 minutes, are free and bookings are not required – just turn up and join in on the fun! Bring a water bottle and towel, and a yoga mat (where required) if you have one. Some yoga mats are available to borrow, but they are offered out on a first-in, first-served basis. Visit here for further details. Held in the South Bank Parklands every Thursday from 9am-1pm, Little Days Out features a range of exciting kids' activities that are free to attend. The activities change each month and are designed to suit a variety of age groups. There’s no need to pre-register – just head along and get involved. Visit here for further details. Held at River Quay at South Bank Parklands, Sunday Sessions on the Green provides free live music from 2-5pm on Sundays. Head along with a picnic and your favourite drop and relax on the space’s lush lawns. River Quay Green is licensed between the hours of 10am and 8pm daily. Please note that to consume alcohol at South Bank, you must be 18+ and you must have food to accompany your drinks. For more information, visit www.visitbrisbane.com.au.